Tropical Fruit Nutri-Berries Nature knows best. In the wild, there are certain foods a bird intuitively craves and seeks out. Foods with sweet flavors, succulent flavors. 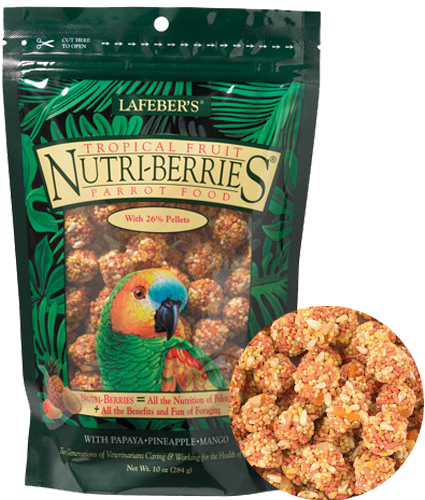 Foods like pineapple, papaya and mango and these very same flavors are used to create Lafeber Tropical Fruit Nutri-Berries. Together with other natural, wholesome ingredients like cracked corn, millet, peanuts, egg and safflower- Tropical Fruit Nutri-Berries provide your bird with the foods nature intended. Lafeber knows nature. Lafeber puts all these tastes together and fortifies it with 100% of the balanced nutrition essential for optimum health. Like foods found in nature, Lafeber gives Nutri-Berries a playful, inviting shape that birds enjoy eating. It turns mealtime into a fun eating experience that birds enjoy. The result? Unlike plain seed alone, birds eat almost all of the berry. 96%, in fact. Which means none of the nutrition gets wasted. And neither does your food budget. Birds know what's best for them and now, you can provide it.